Heat the oil in a large pan; add the curry leaves, onion, ginger and green chilies and cook, stirring until the onion is soft. Add the turmeric, followed by the fish stock, coconut milk and salt, and bring to a simmer. Let simmer for a couple of minutes, check that the seasoning is right then add the mussels, cover with a lid and simmer for 3-4 minutes. Remove the lid and check if all the mussels have opened, for those that haven’t opened, cover the pan with a lid and simmer another 1 minute. 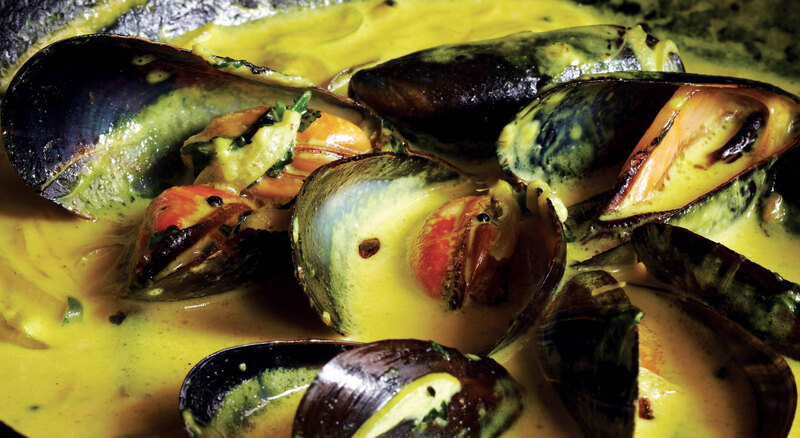 Remove from the heat, discard the unopened mussels. Serve with plenty of bread. You can serve either fresh naan bread or some pre-made rice pancakes ( Uttapams) with these….